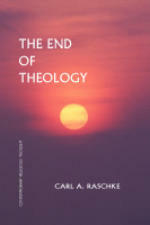 Title: The End of Theology Author: Carl A. Raschke Imprint: The Davies Group, Publishers soft cover 164 pp. USD 20.00 ISBN 978-1888570533 August 2000 In 1979, publication of Carl Raschke’s The Alchemy of the Word brought the deconstructive philosophy of Jacques Derrida into the arena of theological discourse and marked the end of theology as it had been understood by many. Now revised and reissued as The End of Theology, this work is an important contribution to understanding the possibilities for what can be a creative postmodern secular theology. The first chapter examines the aims and the shortcomings of language analysis as it has been used in the examination of religious and theological statements. The second chapter investigates the broader spectrum of modern theories about the nature of language. The third chapter recapitulates the rudiments of Heidegger’s thought, who is identified as most fit among modern philosophers to tackle the underlying question of meaning. The fourth chapter moves out of Heidegger and toward a resolution of the problems of meaning and interpretation in proposing a “radical hermeneutics.” A radical hermeneutics does not only inquire into the significance of texts but also into the essential core of language itself, including religious language. The fifth chapter discusses the way in which a radical hermeneutics must undermine conventional theological procedures and secure a view of religious speech that is prior to “God-language” or to the “Word of God.” Such a view is directed to what Heidegger takes as the “originary” logos that is both a pre- Christian and a post-Christian context of “revelation.” The final chapter criticizes Heidegger’s own “mystifications” about language and endeavors to take his thought one major step beyond. Contents Preface Chapter 1. The Linguistic Turn Chapter 2. Glimmerings of Transcendence Chapter 3. Martin Heidegger’s Understanding of Language: Meaning What Is Unsaid Chapter 4. Hermeneutics as the Recovery of the Unsaid Chapter 5. The End of Theology Chapter 6. From Theology to Dialogy Reviews “Carl Raschke’s writings are always insightful and provocative. His clear understanding of critical philosophical issues lends his theological reflections and cultural analyses unusual depth. Anyone interested in contemporary debates in theology and the philosophy of religion should read The End of Theology.” —Mark C. Taylor “Carl Raschke’s enquiry into the possibilities of a radical hermeneutics both exposes the metaphysics at the heart of ‘religious experience’ and turns us to face the difficult question of what it might be to experience God in the closure of metaphysics. Lucid and acute, it is a book that challenges us to think more deeply and to live a little closer to the edge.” — Kevin Hart About the author Carl Raschke is professor of religious studies at the University of Denver. His major books include The End of Theology, Fire and Roses: Post-modernity and the Thought of the Body, The Engendering God, Painted Black, and Theological Thinking. He is the author of over two hundred popular and scholarly articles on subjects ranging from postmodern religious thought to computer-mediated education to new religious movements.